Probuilt is a leader in the lighting industry and we have them! FEATURES: Accessory outlet for linking units together Removable reflector for 360° lighting IP44 design for dust and water resistance Non-slip rubber base for leaning against walls 15-ft. integrated power cord Lighting Range 5-10 Feet The ultimate is durability, portability and versatility. The 2-foot Defender .. FEATURES: Polycarbonate Lens IP44 design for dust and water resistance Rubberized carrying handle and base Low energy consumption 10-ft integrated power cord Portable, lightweight, and durable, the Defender Floor Lights deliver big brightness from a small package. Heavy-duty impact resistant housing keeps them on the job. Co.. DESCRIPTION The Hang-A-Light Defender LED Floor Light is a superbright, extremely efficient, durable floor light that features 64 LEDs. Delivers 350 Lumens. UL listed. 64 LEDs deliver 350 Lumens for superbright performance Low heat output means no hot surfaces to worry about Includes 10-ft. integrated power cord Dust- and water-resistant design 10in.L x 1.. FEATURES: Accessory outlet for linking units together Removable reflector for 360° lighting IP44 design for dust and water resistance Non-slip rubber base for leaning against walls 15-ft. integrated power cord Lighting Range 10-15 Feet The ultimate is durability, portability and versatility. The 4-foot Defender Uplight v2’s have extreme.. FEATURES: Can be see up to 3000 feet 18" long and 3.4 lbs. Lithium Ion Battery - 100 mins on high/140 mins on low Recharges in 1-2 hours Beam can be adjusted from spotlight to floodlight Rugged, bright and durable the ProBuilt HID Xenon Torch has a military grade aluminum alloy casing. 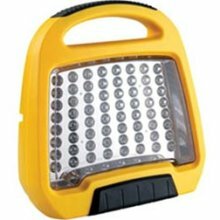 The 35 watt HID Xenon bulb will produce..
26 high-output LEDs Rechargeable NiMH batteries Hi/Low brightness settings to maximize power Multi-positioning retainer Hi-impact lens and housing Detachable upright stand Rubberized foot and handle Run time of 6 hours (low) or 3 hours (high) Supplied with 120v adapter/charger ..